For beginners, intermediates, and even advanced-level people into the Ketogenic diet, it can seem challenging to come up with meals that are at once delicious and acceptable under the dietâ€™s restrictions. 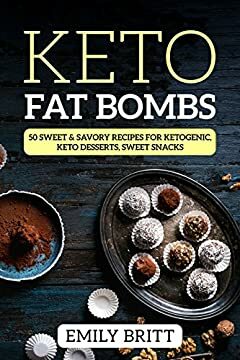 Using Keto Fat Bombs: 50 Sweet & Savory Recipes for Ketogenic, Paleo & Low-Carb Diets, you can follow the Ketogenic diet more effortlessly than ever before, cooking up fat bombs that are tasty, savory, sweet, and completely a-okay under the Ketogenic guidelines. For anyone who has struggled in the past or feels like they are struggling now to keep up with the Ketogenic diet, this cookbook is your way forward. It features both recipes and technical explanations, so you will become an expert in the Ketogenic field while you are cooking meals for yourself! Read on and give your body the support it needs. Â Your best health days are still ahead of you!